Call it a test, an exercise, a reduction, congealing, or protrusion; whatever those may be, can all suit what became a temporary choice to appease necessity. 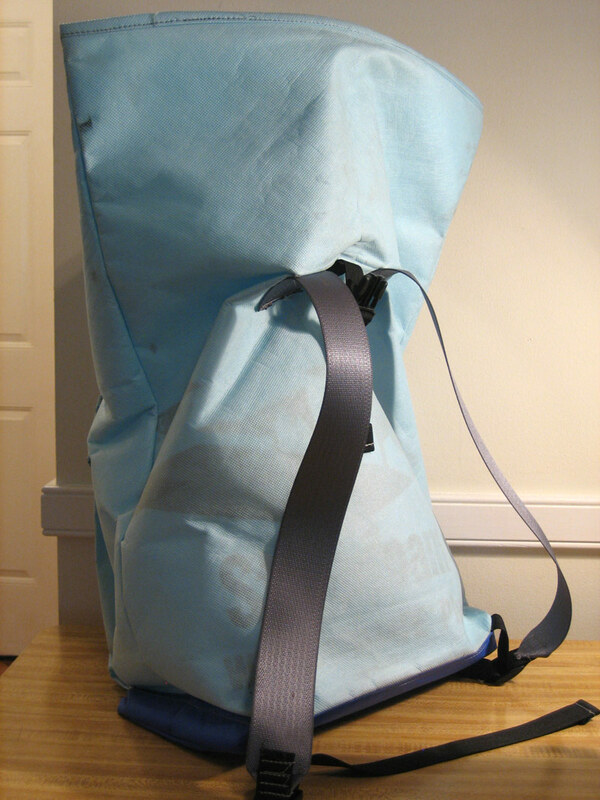 With the walking bag behind us, and a soon to be considered “messenger bag” on the horizon, a simple vessel would provide two things: a quick tutorial in the most fundamental aspects of the walking bag’s current pattern, and a unit for portaging parcels in the meantime. Taking note from the walking bag, this temporary unit incorporated the most indispensable aspects of that elder bag, and then stripped everything else down to bare-bones. Some of the things lost, also provided gain in the sense that this bag was easily produced, in very little time, which alternately offered more opportunity to look at the bags flat footprint/pattern and see what dimensions would be kept, and which would be refused. The walking bag’s main compartment when laid out flat was approximately 58″x19.0625″ which after making this second bag, was probably just right. 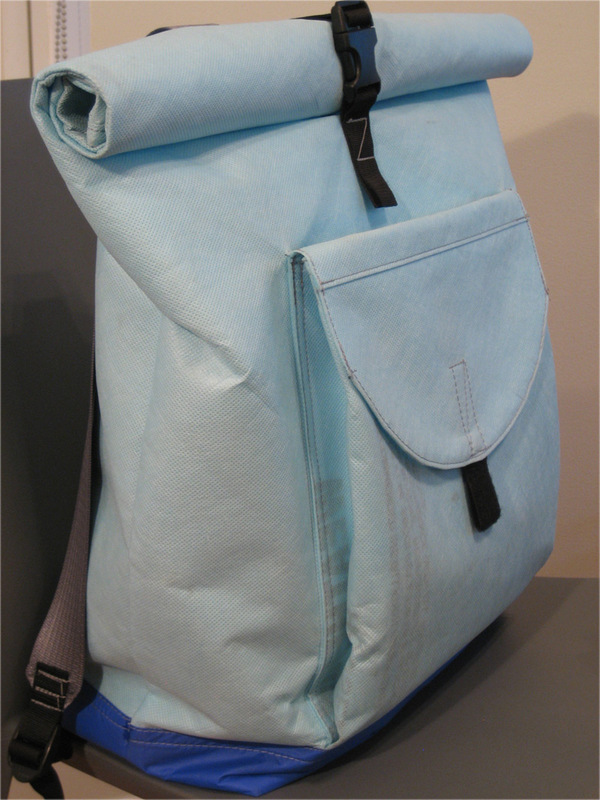 The new bag started at about 58″x20.0625″, which is almost more bag than desired (even though the extra inch is not much), as it should be a bit more slender in it’s profile. However, this additional bit of bag may be because the newer bag does not have compression straps like the walking bag did/does. And without the compression straps the Dow Pack tends to hang straight down – at the same width as the actual rolled up top, therefore, even though it is only slightly wider, it looks much wider because nothing is compressed or pinched below the rolling point. Other than that subtle shift in the pattern, the rest of the alterations were along the line of it’s corresponding accessories and use of materials. 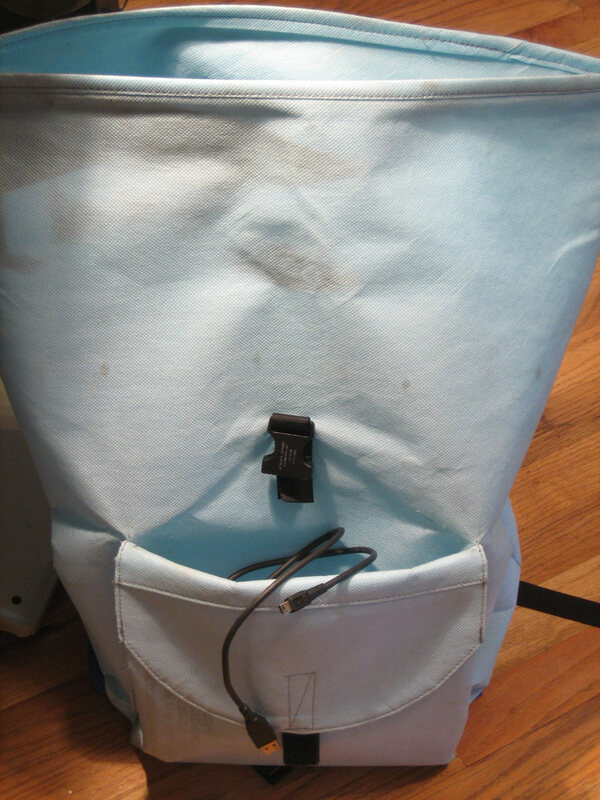 The two main losses of the Dow Pack are the padded shoulder straps and the side-zip quick access point into the main cavity of the bag, which the waking bag relied so heavily upon. 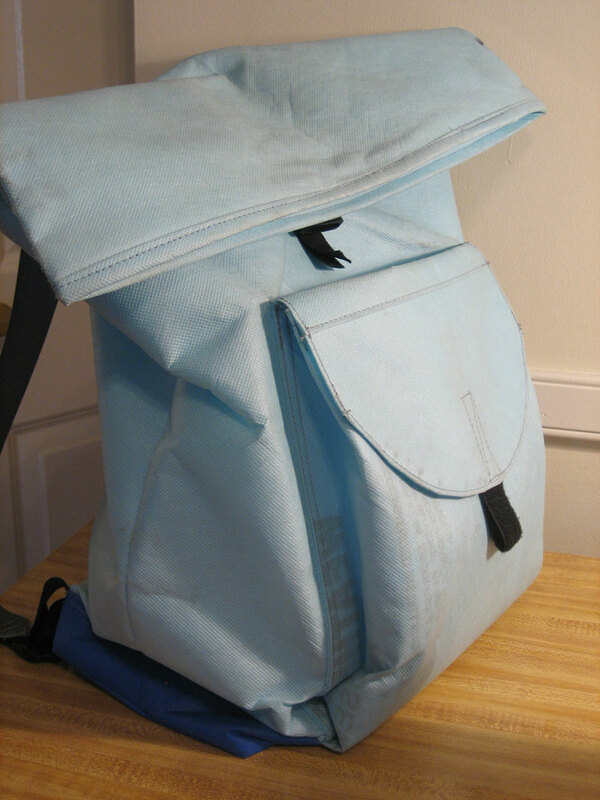 Of course part of the back story on the walking bag is that it had excess seams due to a mishap in the pattern cutting, so to utilize this accident, a zippered section was embedded in one of those necessary, but not planned on, joints. The Dow Pack is free of this feature – with a bounty of Weathermate at hand, there is no need to make any patch-worked pieces of it to fulfil pattern dimensions, unless desired. Next, Instead of the padded shoulder straps seen on the walking bag, the Dow Pack uses very simple sections of 2″ seat-belt webbing. This was chosen to minimize build time, reduce costs, and of course to see how much of a difference it makes. In hind-sight, the padded shoulder straps had one main advantage, and that is the shape, with the straight facing-profile of the seat-belt straps, they do not end up sitting quite as close together across the chest as one may like. This does not make them a blunder by any means, it is just a choice one has to make when considering fit. Also, the seat-belt webbing straps are probably a little heavier, so if keeping the pack’s weight down is a must, then padded straps are the way to go. Finally, materials composed the largest part of the shift between the two designs. 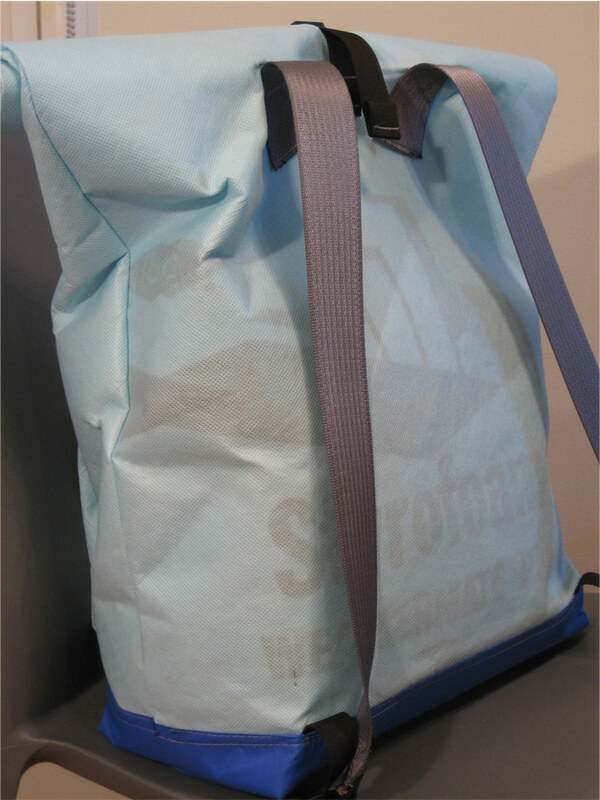 Obviously one aspect is in the seat-belt webbing shoulder straps, but the other material trades are in the main bag. These changes were to address different material options, but more importantly to work with the Dow Weathermate in a different way to test it’s capabilities further. There is one issue using Dow Weathermate; it is not the most durable material when it comes to abrasion. The Weathermate has two sides to it, one which is the “raw” Styrofoam side, and one that is coated with some type of micro-esque synthetic filament. This coating has a similar structure as the urethane coating on the back of Cordura, except that it appears to be attached in such a way that opposes Cordura’s urethane coating (please bear in mind that a lot of this is speculation, and using terms like urethane, micro-esque, filament, etc. are only for descriptive purposes and do not necessarily converge anywhere with factual information). From past experience, we assume that the urethane coating on Cordura is brushed on, like a lacquer of sorts, so it partly wicks into the material, and it’s own chemical compounds act as the glue. Unlike the ensuing hypothesis, that Dow Weathermate’s coating is actually a separate sheet of a very thin synthetic sheeting, which is glued to the surface of the plain Dow Weathermate Styrofoam. With that said, this may explain why, when the Weathermate begins to abrade and/or de-laminate, it tends to happen like peeling wallpaper. If a little has been curling up, it seems that you can then grab a little more and peel a bit off. Underneath all of this is just the Styrofoam however, same as the un-coated backside, this is how the material is both breathable and water repellent. The coated side’s porosity easily keeps moisture out, while, from the back side, moisture is absorbed into the Styromfoam and then dissipates through the tiny fibers crevices of the coating. We think. All in all, to maintain this coating, and add more life to the products abilities the Dow Pack was built with the coated sides facing inwards, which in this case means completely concealed, as all the surfaces are composed of the outside shell, and an inside lining. With the coated sides facing each other, this should greatly increase the life of the Weathermate, and surprisingly enough, the un-coated “pure” Styrofoam side is very resistant to abrasion. Top all of this off with the Dow Pack’s 1.9 oz. silicone coated ripstop boot, and you have a very lightweight, almost completely recyclable bag (there are bits of webbing and buckles that may impede that process). This more or less concludes the current notes on the Dow Pack. It was built with Gütermann “extra strong” 100% polyester thread, a teflon presser foot for sticky areas, and only a few random pieces of 1″ wide webbing, buckle, and Velcro. So far the bag has been used almost daily with no tearing, and total water resistance. Certainly the inward facing of the Weathermate’s coating had made a big difference in durability. 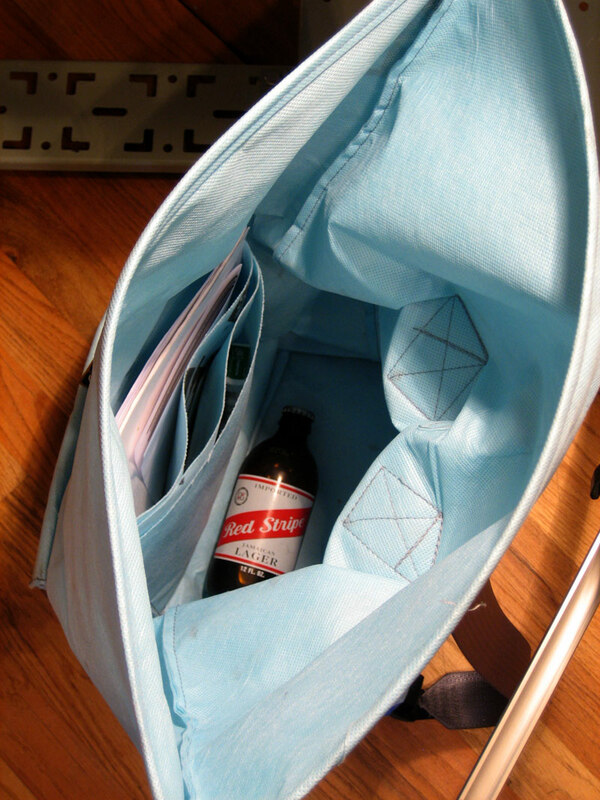 One thought for next time is to make the length-wise measurement at least 60″, as 58″ is a little short for adequate rolling, when the bag is designed to be about 20″ tall. Last, but not least, for the books, when making your own bias tape, trust your judgment and remember to factor in for how much material loss there is in folds and bends. It might be important to note that while Dow Weathermate is indeed impervious to water in visible amounts (i.e. water droplets, rain, etc) Weathermate is built to allow water vapor to escape and so while it’s water-tight it also has the ability to breathe.